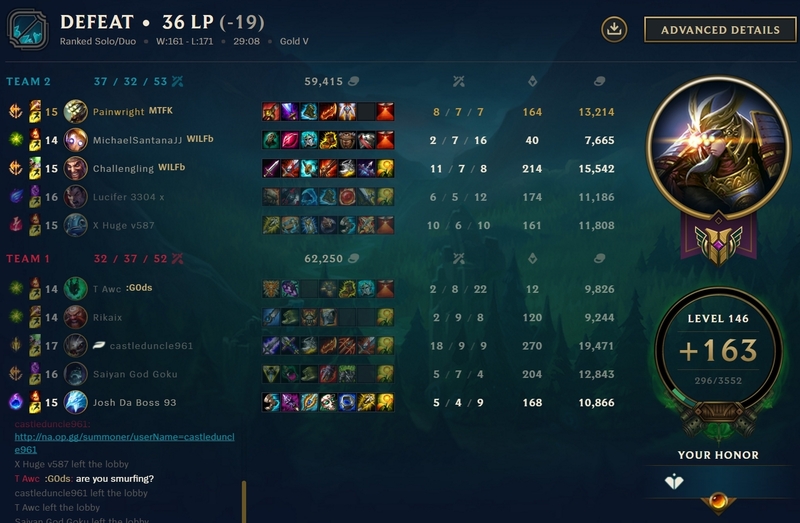 Been playing some Master Yi. 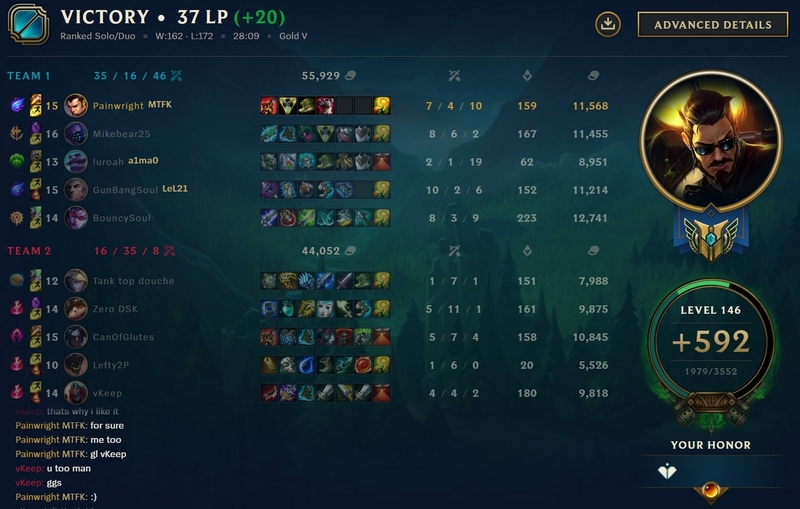 It is nice having a champion that ramps up into the game unlike Xin Zhao were the game feels like it gets harder as the game goes on. And Master Yi's early game is not as godawful as it is made out to be. As long as you hold onto your E, Wuju Style and only use it if you get invaded or want to duel some one you actually do surpisingly well vs even some of the more well known duelests. 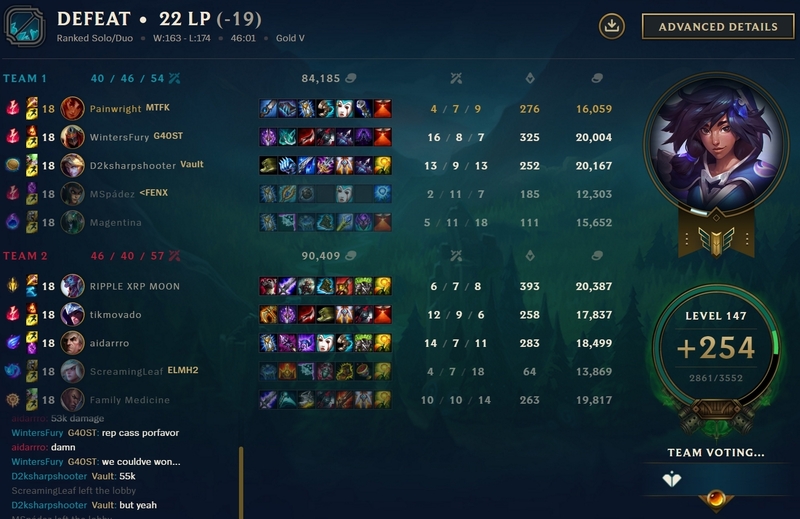 The most difficult part of this game was dealing with a fed LeBlanc who could delete our fed Kai'Sa. Fortunately our overall team fight was better and Nunu & Willump started making poor choices about how far ahead of his team he got. Oh and burning through objectives. Ahh, Yi goes through Dragons, Rift Heralds, and Barons like a hot knife through butter. Much easier to solo them than it is with Xin. 23 minute baron then a follow up fight where we caught the Ornn and then erased the majority of their team. Knew when we killed Shyvana between myself, with Guinsoo's Rageblade compelete and Vayne we could do Baron. One death I decided to cut off the Shyvana but I didn't respect how fast her teammates could respond. Need to remember that I'm not invincible. Can still lose at 2 v 1 (or in this case what turned into a 4 v 1) with enough CC thrown around. Used Meditate to avoid getting taken out by a Jinx rocket. Early game went like this. Started Red Buff and then got Yasuo's Flash and unfortunately Lux had Teleport and not Ignite so Yasuo got to walk away on maybe 10 health. Got Top scuttle. Then wasted a lot of time ****ing around with Lee Sin on the Bot side of the map. I got that scuttle too, but then Lee invaded me and got my Blue since I didn't have Smite to secure it since I had used it on the scuttle in front of him. I was pretty low too, and I wasn't getting any rotation from my laners so I just left that side of my jungle. Took my Raptors and then too his Blue which was still up, but I neglected to notice the Yasuo moving and between hima and Lee showing up I ended up dying. 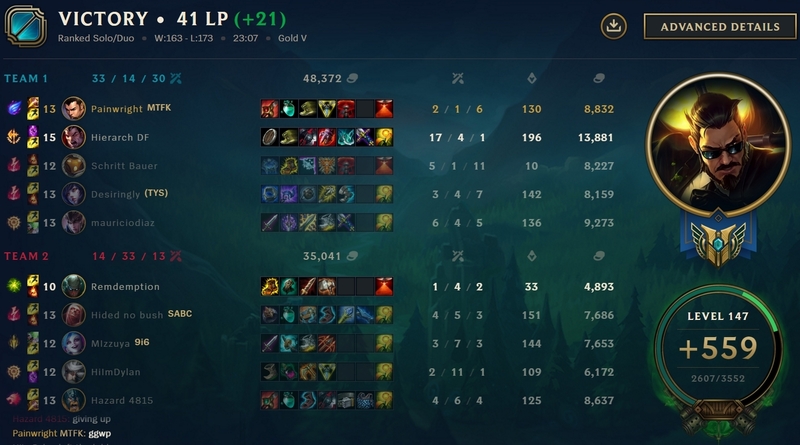 So needless to say I was kinda screwed and down in levels and withouth the Yasuo first blood down in gold from where I might have been. No one else on the team was able to make up the difference so we ended up caving to them across the map. Yeah, Kog'Maw happened. I was really suprised when Draven and Blitzcrank were stuck under their turret vs the Kog'Maw and Thresh. Figured our lane should have had pressure, but no. We killed them a couple of times, but it wasn't enough. Needed Fizz to get on him every time early and it just wasn't happening. Was planning on building an Adaptive Helm last item, since I needed armor item to even have a chance of dealing with the the Yorick who just pound my *** into the dirt, which he did twice in one walk down a lane. And nope. Strategically minded Sion strikes a wins. Kinda didn't help that my Miss Fortune was 7000g behind the Lucian. Apparently she only plays Caitlyn? which Varius banned. There was never actually any team fighting because Garen and Sion were off doing their thing, so really no way to setup a situation where MF could get off and ult, so our comp which had ways of holding them in place never really did that. 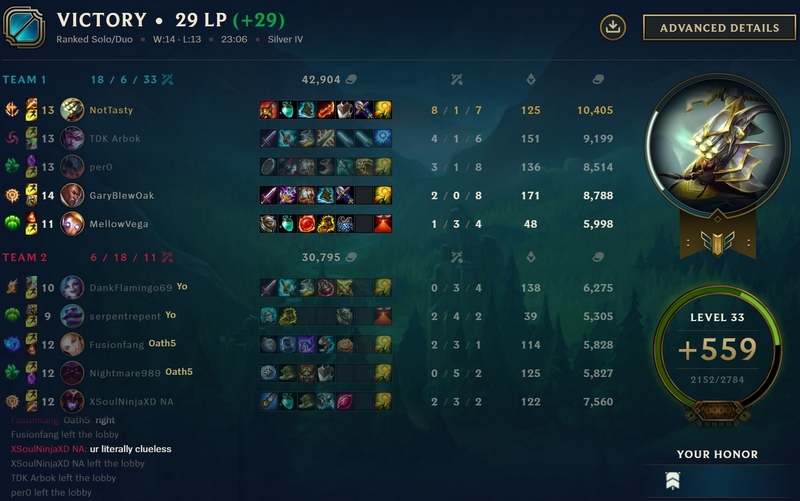 I think if I'm playing Master Yi again with the Sion in my game, I build completely to kill them as fast as possible. And F, I'm doing it, again. Hardest thing in league of legends for me is sticking to one champion. I want the easy way out. Not learning the fundamentals. How to get ahead, how to stay ahead, what to do if behind, etc.,. I'm sitting on a 60% winrate on Xin Zhao and always immediately want to play something else whenever I lose on him. 60% is good enough to climb. It does not mean that I will win every game. Had good teammates. Vayne was confident in chat even when things went a little awry. I think that helped with morale. We definitely had some things go awry upon occasion, but we bounced back and continued to play aggressively. 1 death, I was trying to prevent them from getting 1st turret gold, but I wasn't going to get there quite in time. I decided to go on the Kayn anyway and got him, but Teemo took me out. Not sure if I should have taken that, but once I was in, I was in. I think the better thought would be what is the state of the map if I do this? Like before I go in. Is my Bot lane in peril? Are all my camps up so I would be wasting time I could be getting a lead through farming. Kayne did not have shutdown gold, so I didn't get a major windfall for killing him in exchange for my life. I don't believe I gave over a shut down either as I was like 2-2-2 at that point if I remember correctly. To tunnel on that play because I didn't think about that thing. We had no real engage besides me suiciding or making picks. 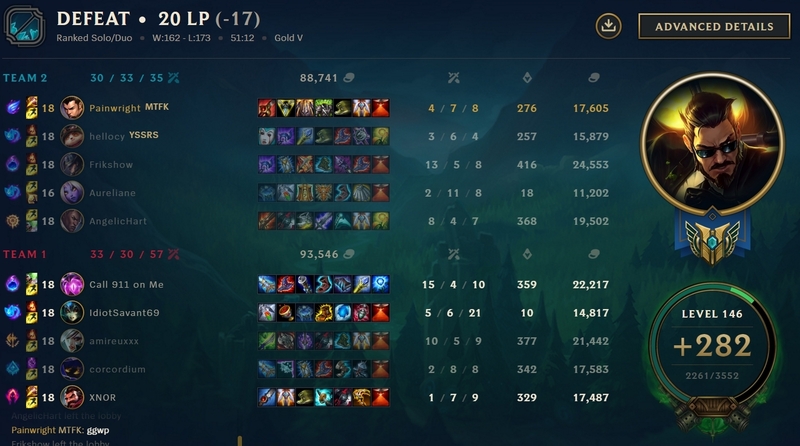 Since they couldn't get onto them and everyone of us had trouble getting out of Vel'Koz's ults late game when he was sporting a bunch of slows we just couldn't win team fights and Teemo couldn't split agains the Riven. 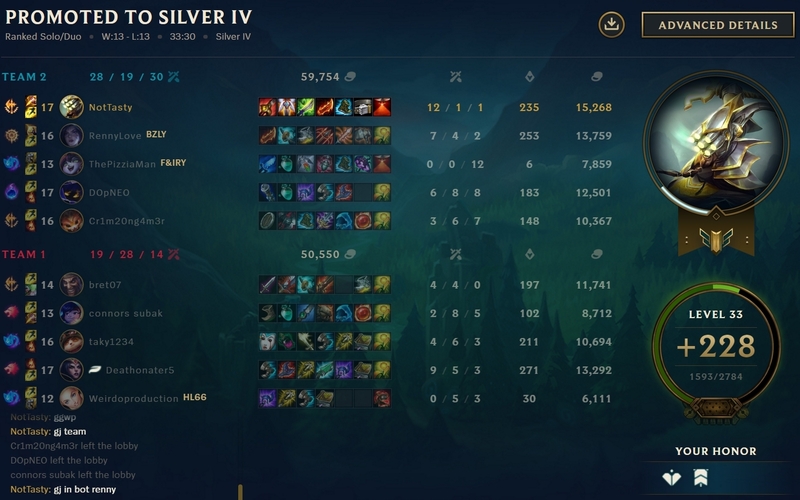 I screwed up several plays by being overly aggressive in spots and also by splitting from my main team when we had Baron I was trying to stay between Twisted Fate and the other 3 to try and catch Graves out but in retrospect we didn't quite have the wards for it and our team got engaged on. That was probably out chance to win the game, but not sure because we had real trouble sieging against them without splitting them up. In retrospect I should have gotten a Guardian Angel as my third item and just been the sacrifice to get something going. Darius wrecked Camille and continued pressing his lead without being too greedy in most cases. Teamed up with Bard for a gank in Bot lane. One death was an overstay taking their Mid base turret. My other two teammates got out but I did not. It was not quite the right thing to do considering the death timers, but it was one those by seconds things. 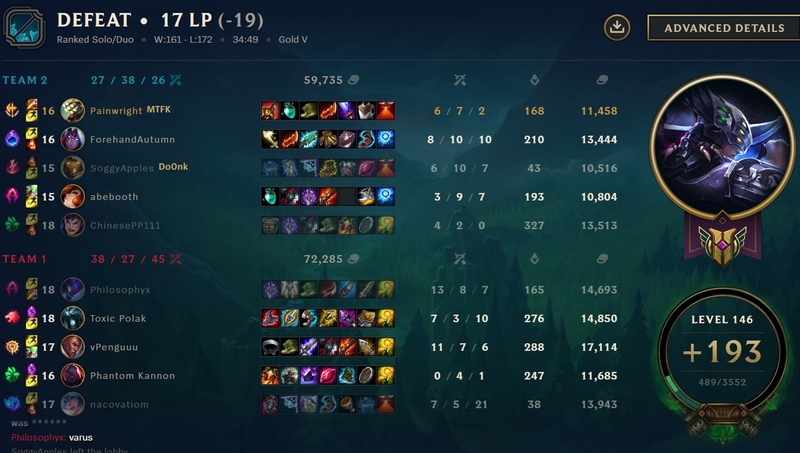 One of those games where I was high up in the pick order and everyone is all showing AD so I pick Taliyah and then everyone picks AP. 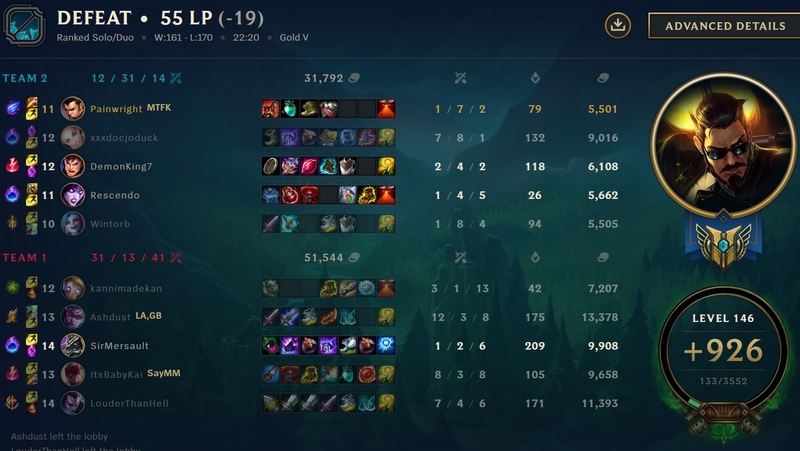 My team made so many mechanical and map awareness mistakes in the early game it is a wonder that the enemy team didn't roll us up by twenty minutes. They didn't. We managed to wipe them and get Baron. Good call on I think Zed's part by the way. I didn't think about us having a Cassiopeia. Anyway, out Cass DCd after we got the 2nd Baron and it was done. Had to tell my team to cut the chatter in chat. They did for quite some time, but once Cass DCd, AFKd or whatever they were back at it. It would have been nice to have a tank somewhere to front line but that would have given Trundle stats to steal with his ultimate, so. I did think my team did a pretty good job of working around the Talon. He generally wasn't instant nuking everyone left and right, which I've seen happen in quite a few games he is in.